Blue wildrye is an erect, rapidly developing, cool-season, native perennial bunchgrass with long smooth, waxy stems. This bluish tufted grass can grow to shoulder height (.5-1.5m) from fibrous roots or short rhizomes (although in the Pacific Northwest blue wildrye is rarely rhizomatous). Green stems slowly turn straw colored in the fall, dropping seeds and leaving thin twisted empty stalks behind until another growing season. 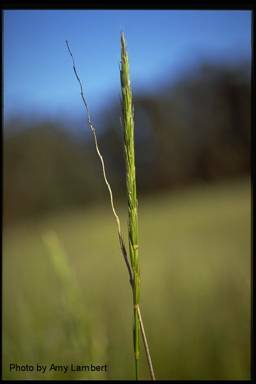 Blue wildrye is the most common and widely distributed of the western wildryes (Elymus spp.). It occurs throughout western North America from Alaska to Ontario southward to New Mexico, northern Arizona, California, and Mexico.1 Introduced in Eastern and Central North America. Blue wildrye occurs the length of the Pacific Northwest, mostly west of the Coast-Cascade Mountain crest2 in prairies, open woods, thickets, and moist or dry hillsides. Typically occurring in grasslands in northern and southern portions of the Puget Lowland and the adjacent Georgia Depression of B.C. (two subspecies are found in B.C.). seed; may also be propagated by division. Seed ripens in early July in the foothills and in late August at higher elevations.4 Hassell and others recommend only using seed from local sources, preferably from within 300 miles (500 km) and 1,500 feet (500 m) elevation of the intended site.12 Libby and Rodrigues discuss the potential for ‘genetic contamination’ of native populations of blue wildrye by commercially produced seed. They question the use of single collection over a very large area. Seeds remain viable for 2 to 5 year, but one studied showed percentage germination of mature, cleaned seed stored at 59 to 86F dropped sharply after 2 years. Sow directly in the fall to a depth of .6-1 cm at a density of 100-160 seeds per square meter and cover with sawdust mulch. Spring sow from March through early May. A nitrogen starter fertilizer is recommended, and a complete fertilizer when seedlings are well established. Commonly grows in tufts of 4inches or less.2 Plant in 1 foot centers for dense cover. Like other bunchgrasses, water seedlings with at least 2 liters of water on the day of planting and/or water as needed during the first six months after out planting. Hitchcock, C. Leo; Cronquist, Arthur; Ownbey, Marion. 1969. Vascular plants of the Pacific Northwest. Part 1: Vascular cryptograms, gymnosperms, and monocotyledons. Seattle, WA: University of Washington Press. 914 p.
 Klinka, K., V.J.Krajina, A.Ceska and A. M. Scagel 1989. Indicator Plants of Coastal British Columbia. University of British Columbia Press. Chappell, C. 2000. Plant community descriptions of the Puget-Georgia-Willamette Ecoregion, unpublished. U.S. Department of Agriculture, Forest Service. 1937. Range plant handbook. Washington, DC. 532 p.